April turned out to be an eventful, fruitful and an exceptionally busy month over here at 16-BIT Shock HQ. Unfortunately all that activity didn’t translate to regular blog updates which isn’t something I’m particularly happy about. Ideally I would love to post an article at least once a week but that’s not possible with my current work schedule. Nevertheless, I do plan to post on more regular intervals in the coming months. The increase in workload over April was due to fine-tuning and tweaking of existing game projects. Some further fine-tuning was also applied to the current business model. In order to deal with a shifting gaming landscape, some changes were necessary in how future projects are to be executed. PC & mobile game development are two entirely different beasts and require their own unique approach. Another area I spent considerable time on is sharpening my physics GML scripting skills. While GML shares a lot of similarities with Java and even C++, it does have it’s unique quirks which can be both funny and frustrating. Generally I only foresee limited use of some of the physics code I put together. Mainly for craft and character movement as that’s what it’s most suited for. I even got round to using GM Studio’s 3D features, quite a change for a 2D game developer. Surprisingly it seemed a lot easier to implement a 3D environment than I expected it to be. There are no plans to develop any 3D games but if I ever decided to move in this direction, I would love to make something similar to Namco’s Cyber Sled or Sega’s Virtual On. 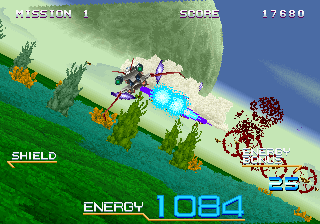 However I’ve been experimenting a bit with pseudo-3D – the type of 3D that consists of scalable 2D bitmaps ala After Burner, Out Run, Galaxy Force, Space Harrier etc. Now this is far more challenging than I expected but I finally got some neat results. There is quite a bit of math involved and precision is mandatory. Any scalable bitmap that is 1 – 2 pixels out of place will seriously mess up proceedings. It’s evident why this type of 3D fakery fell out of favour and 3D polygons were readily adopted back in the mid-90’s. Far from a practical way to depict a 3D world effectively, but nonetheless it’s cool to see again – and quite the nostalgia trip.